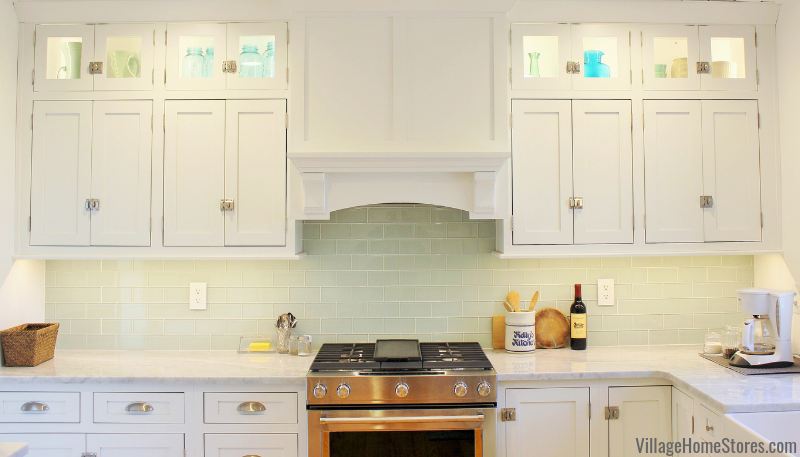 White painted cabinetry is a consistently classic look for a kitchen. For certain projects however, one added detail can take that look to a new level. That detail is choosing an inset cabinetry construction. The term inset means that the cabinet doors and drawer fronts are recessed back into the cabinet faceframes when closed. This gives a very customized furniture-style look to the cabinetry. This option is available from custom and semi-custom lines of cabinet product at Village Home Stores. This Milan, IL kitchen was given the full remodel treatment and for the vision of this new kitchen in the home, inset door cabinetry by Dura Supreme was the perfect choice. The original kitchen was walled-off and sectioned into a small sink area and another cooking area The refrigerator was on its own across the way. Our team removed a wall that divided the dining area from the kitchen to open up the room and create a more open concept into the dining and front room of the home. Two windows were replaced with one large window now offering panoramic views to anyone at the kitchen farm sink in its new location. When the flooring was removed, this great pine floor was revealed beneath it. We think keeping the original wood floors was a fantastic choice with this bright, white new setting. Even though this kitchen may have farmhouse feel, the appliances needed to have modern features while looking at home in the new space. 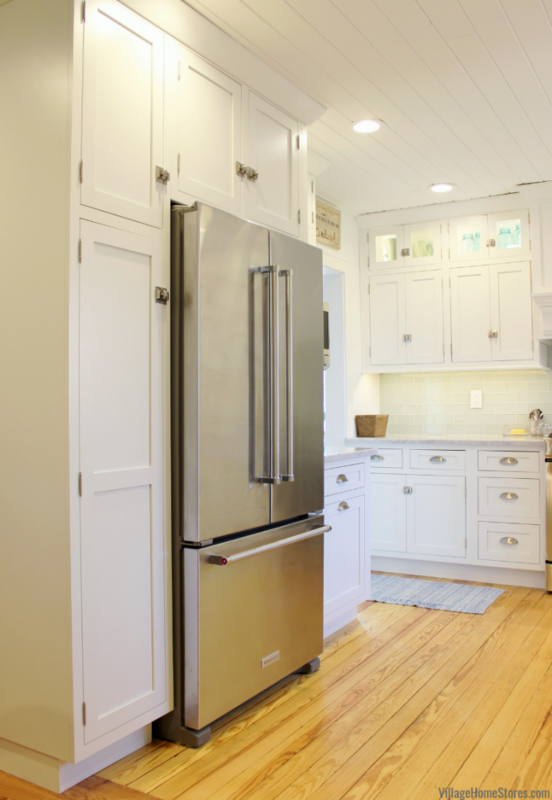 We included a tall pantry cabinet to the left of the refrigerator for a surrounded and customized refrigeration look. 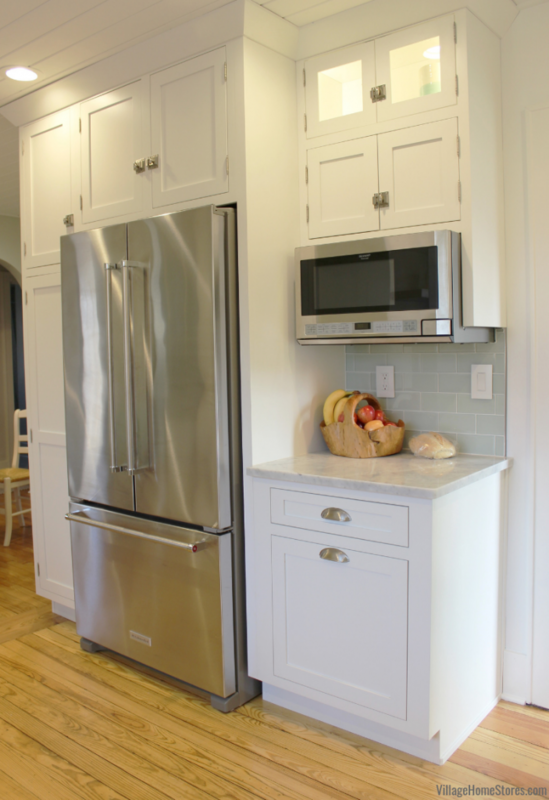 A KitchenAid counter depth refrigerator keeps that built-in look locked in tight. 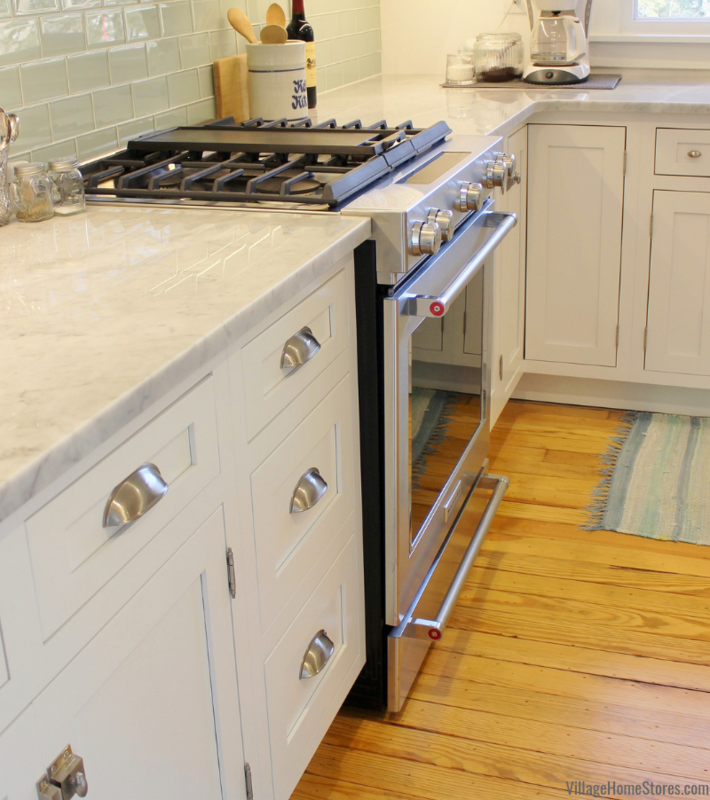 Counter depth refrigeration is a modern feature that can really be a miracle worker when kitchen designing in small spaces. Another built-in appliance that is worth noting is the microwave. The over-the-counter microwave from Sharp allows you to have the off-the-counter convenience of a microwave hood without installing it as your hood. This microwave option gave the client an opportunity to take a more decorative approach to a range hood across the room. We have installed examples of all microwave location options at our showroom in Geneseo, IL. 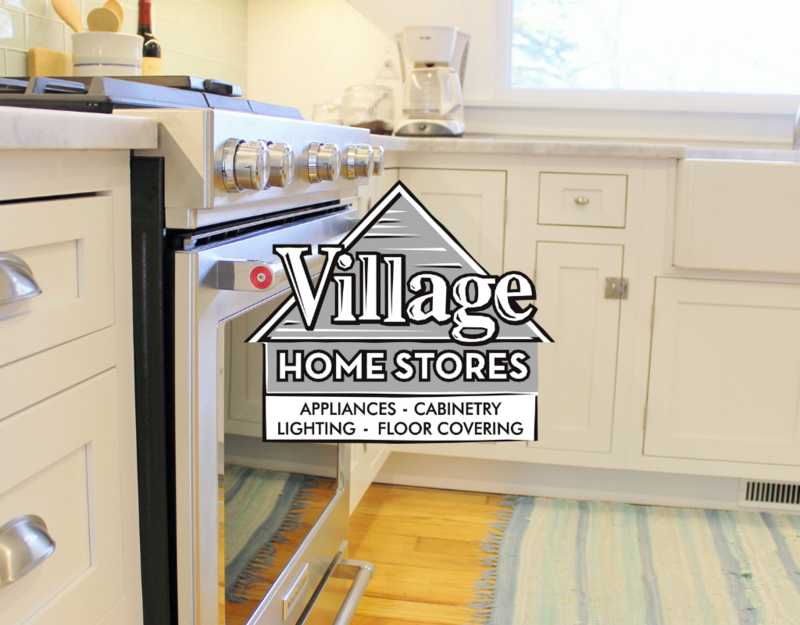 You can shop all of our appliances online, anytime at villagehomestores.com or by stopping in our showroom at 105 S State Geneseo, IL. We mentioned the floors… but did you see those ceilings? Shiplap style boards were installed and painted to give a completed look from floor to ceiling. 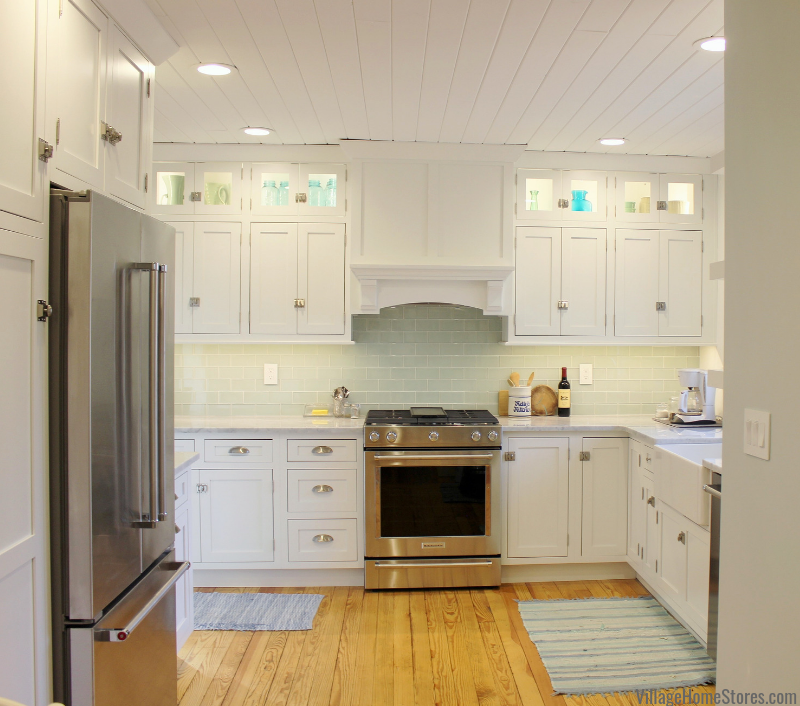 Walking into this completed kitchen remodel the wow factor truly is in every single surface! From the storied original pine floors to the statement Shiplap ceiling. 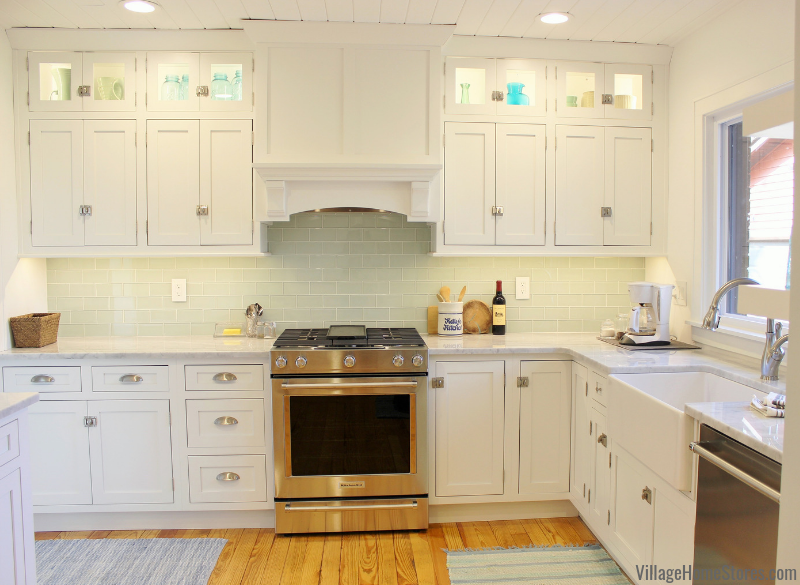 A farmhouse apron-front sink and new stainless dishwasher are located on the bright new window wall. 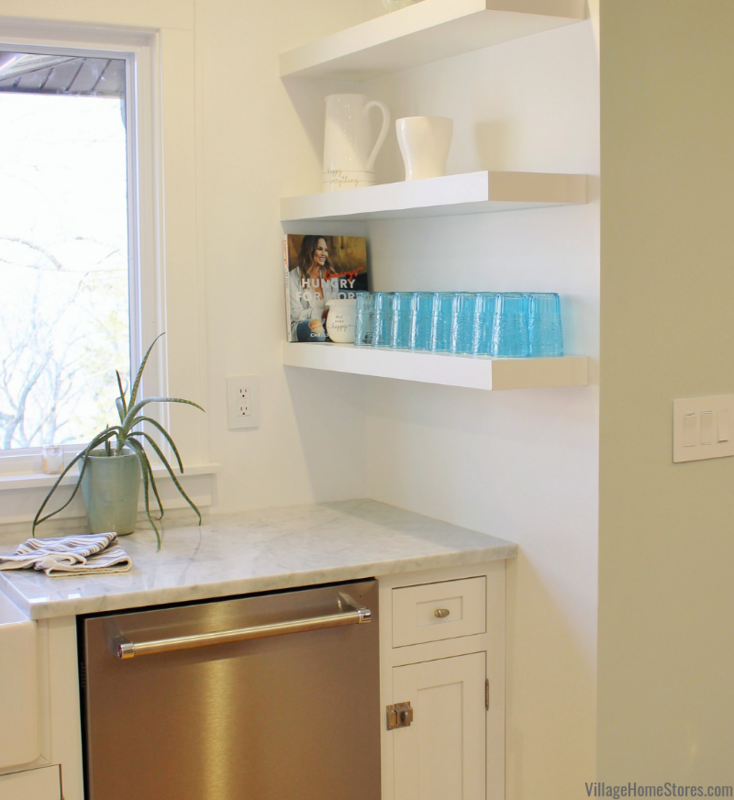 Keeping the kitchen design bright and airy on the sink wall, three floating shelves are located above the dishwasher (see image below). We can order shelving like this for any space. We are seeing a long-term trend for kitchens, bathrooms, home bars, and built-in fireplace shelving to have a more open look like this. We see the potential for styling these open shelf spaces year round but love this everyday simple look of glassware in a pop of color. 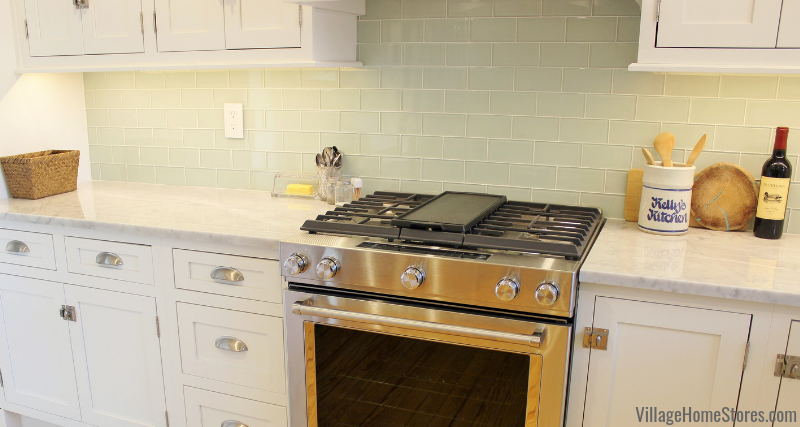 A 30″ slide in gas range by KitchenAid is the superstar appliance in this kitchen. The help of convection cooking produces flawless results for you. The convection fan ensures the inside of the entire oven is heated to (and stays at) the perfect consistent temperature. Plus the oven cavity cleans in less than an hour without odors at a low heat using water to release baked-on spills! A steam rack on the interior offers the ability to provide additional moisture to the inside of the oven, enhancing cooking results. Speaking of results, there is even a wireless probe that lets cooks walk away from the oven without walking away from control. The probe can easily be set to specific temperatures, and alerts you when the desired temperature has been reached. There is also a baking drawer beneath the oven. The separate compartment allows you to keep warm, slow cook or bake at a different temperature and keep dishes warm. That’s like having a second oven! 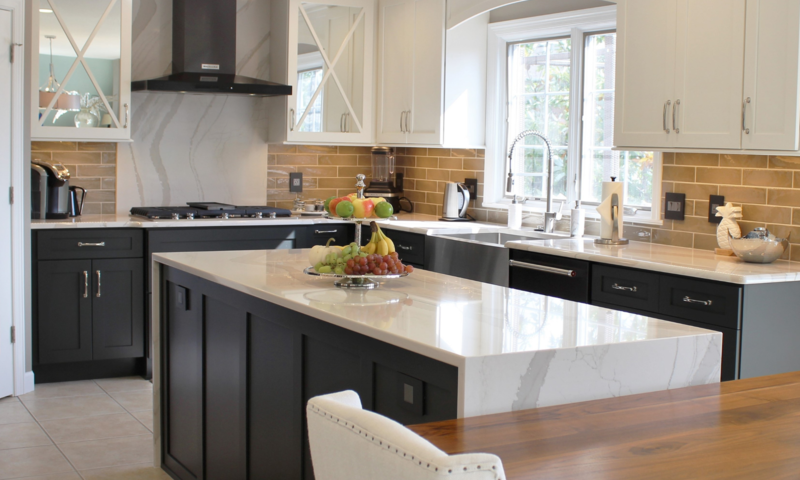 Beautiful Arabescato Marble countertops were installed throughout this kitchen. 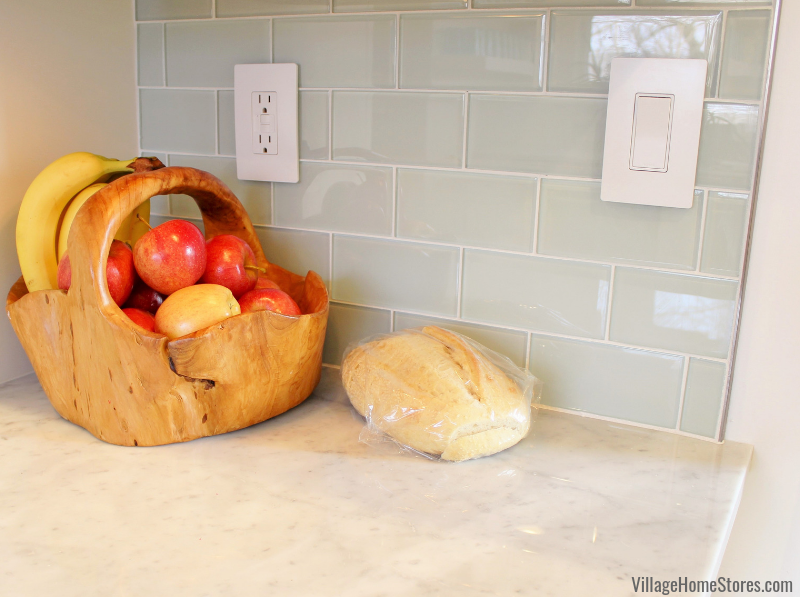 Glazzio’sCrystile “Ice Mist” glossy glass subway tiles in a 3″ x 6″ size introduces a seaglass color and adds a coastal layer to the kitchen finishes. Clean and bright wall switches and outlets from our Legrand Radiant series look amazing. Many times our tile customers are curious what to do at the “end” of a run of wall tile. We use a channeled product called a Schluter Strip (shown below on right) to give a cleaner, completed look. 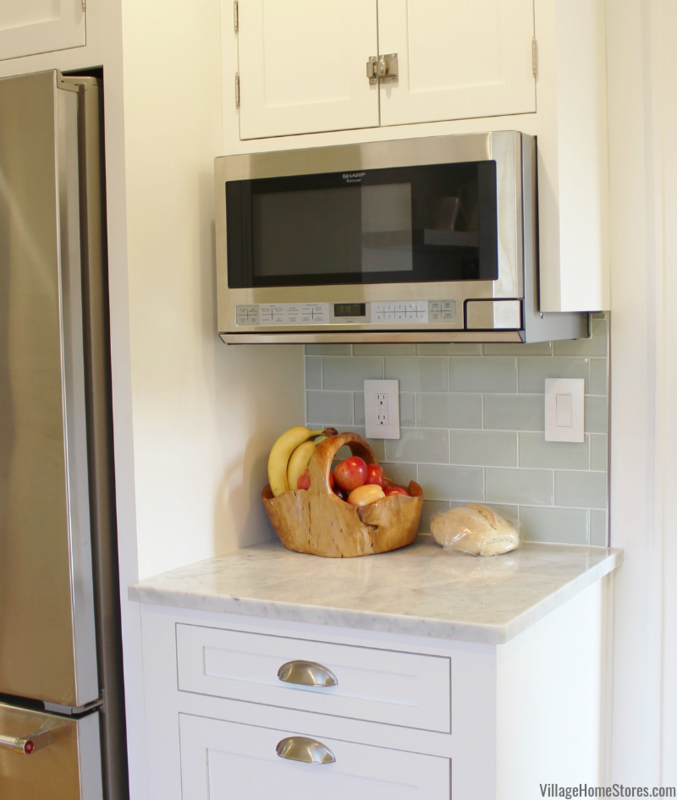 Dura Supreme cabinetry in the Homestead non-beaded doorstyle painted white is paired with bright surface selections to give this home the spacious and stylish kitchen it deserves. The symmetry of the new range wall is perfection. We installed our energy efficient Diode LED lighting as undercabinet and in-cabinet lighting for this project. 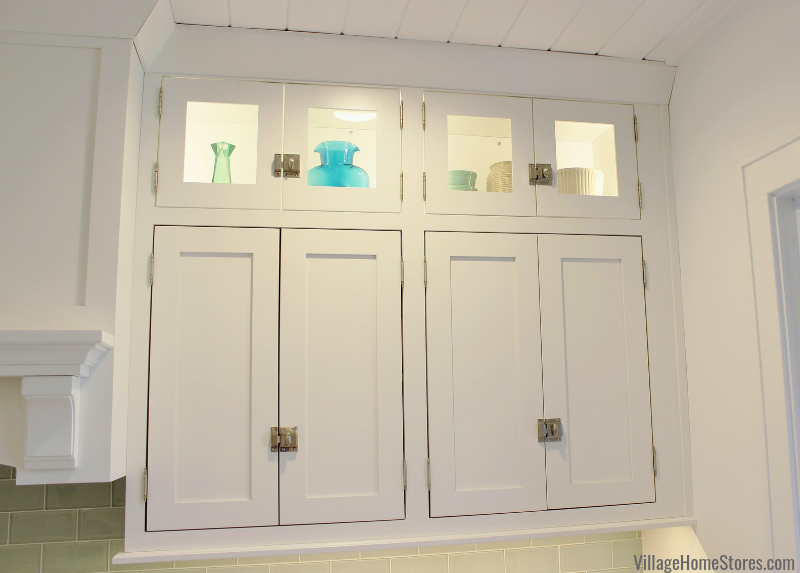 The clerestory style of a glass-door top section is styled and illuminated perfectly. This lighting system is low-voltage so you can leave it on anytime with minimal power use. A stainless hood would be a bit modern for this kitchen. So the design includes paneled a wood hood cabinet with blower insert in the space. 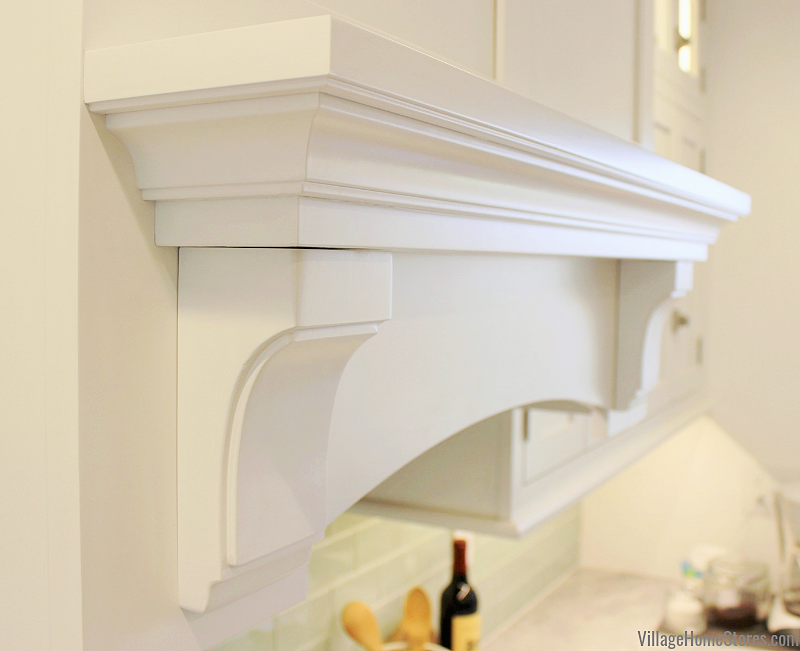 A mantle and decorative corbels create a shallow ledge area that can be left clean (as shown) or be home to a wreath, accessories, or leaning artwork if you see fit. 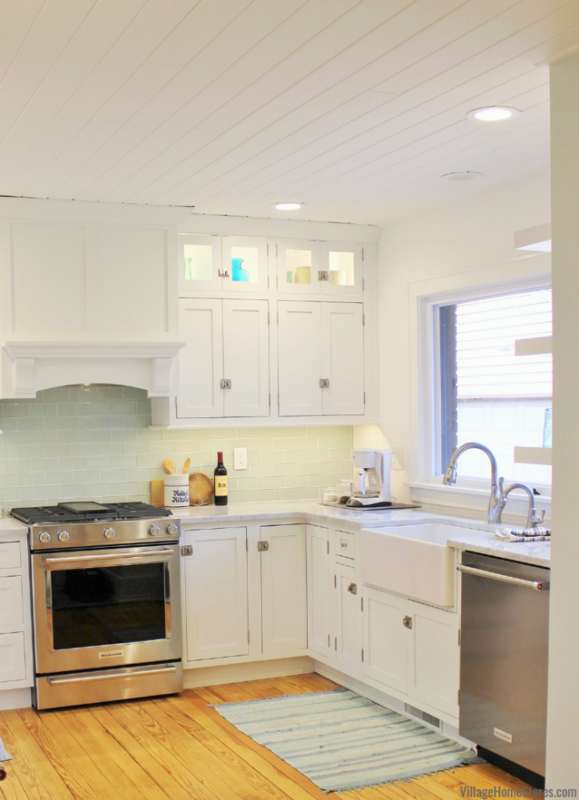 There is such a gallery effect when you have a bright white kitchen like this. You can style it differently year round and let your accessories truly pop against the white paint. Any remodel or new build project comes with hundreds of decisions to be made. Our store will build you a team of experts from each department that you are shopping so we can walk you through your choices and help you decide what is the best choice for your project and your budget. When choosing inset cabinetry you have the option of a concealed or exposed hinge for your doors. This kitchen showcases an exposed barrel hinge in a brushed nickel finish to compliment the kitchen. The nickel finish offers a sheen without a very dark contrast. It also compliments the Stainless Steel appliances in the completed kitchen. 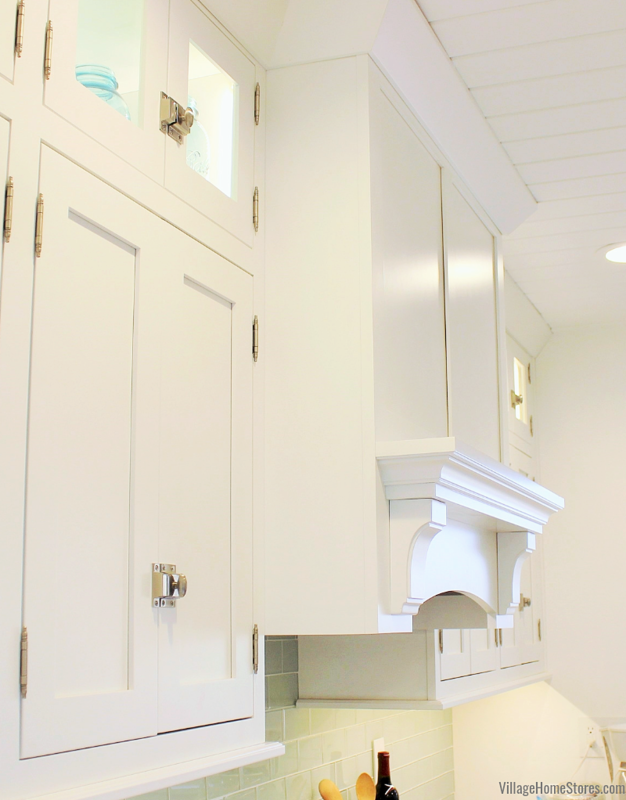 A great door and drawer hardware choice for inset cabinetry was also made in this design. The Highland Ridge Collection has a latching mechanism to keep doors closed and aligned. This style of hardware works well in modern and farmhouse styles and can be ordered in a variety of finishes. 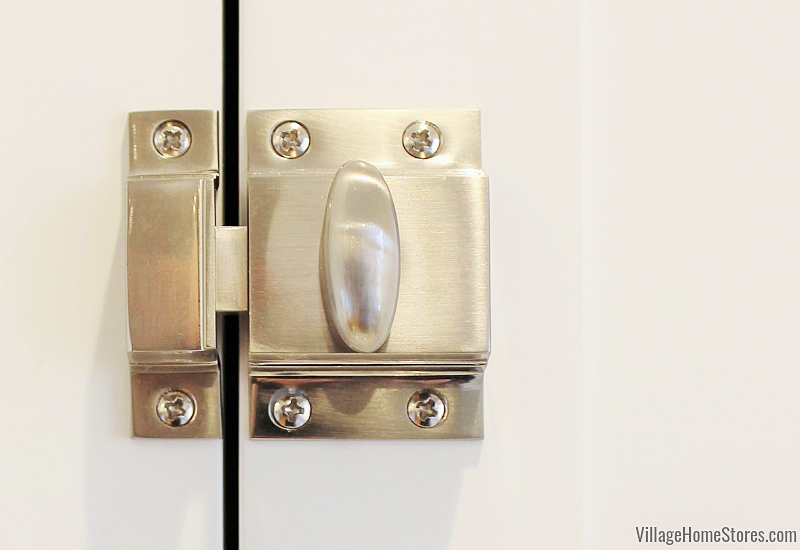 We paired this door hardware with classic cup pulls on the drawers. To see more of this kitchen, be sure to check out the full album of photos here on our Houzz profile. It is amazing how much removing a wall from an existing kitchen can change the flow of the entire home. This new open kitchen plan has dramatically changed this home for the better! If this was your kitchen would you ever want to leave? We are so blessed to get to bring dream spaces like this to life for our clients. Is your own home ready for a new look? Our remodel process includes an expertly created design with full color renderings of the completed space so you can get a clear vision of what the finished look will be before we even start estimating product. If you have been considering a remodel that includes wall removal or relocation, this is a key part of our process you will so appreciate. Your first step in the process is to simple reach out. 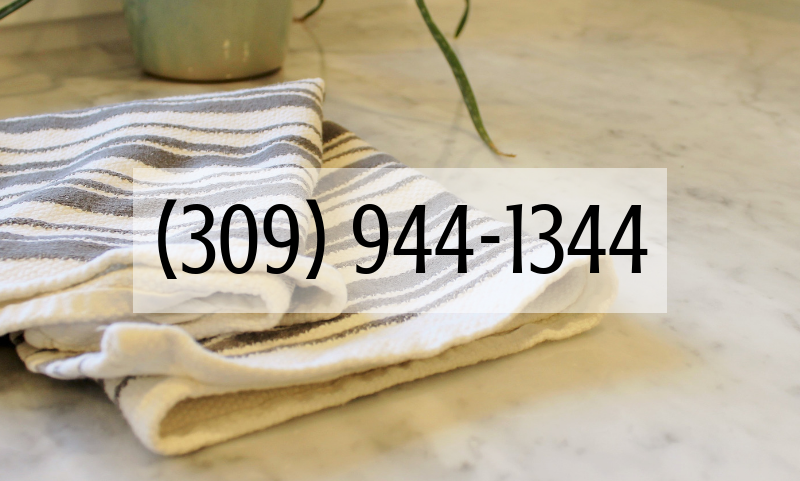 You can call us at 309 944 1344 or complete this short online form for a member of our design team to connect with you. We ca’t wait to get started on your dream space!